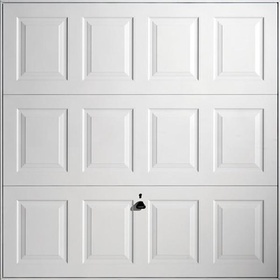 Steel as a material for one piece up and over garage doors has been used for many years now with the earliest of UK garage doors manufactured by Westland Engineering and Henderson back in the 1960's. 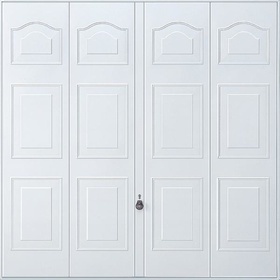 Back then you had a very limited choice of styles and sizes and all the doors were supplied in a primer for painting. The operating mechanism and the locking was very basic but certainly was, like many things back then, made to last. 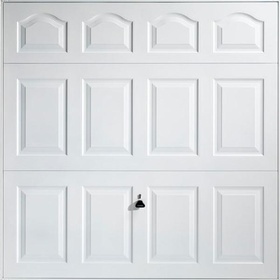 Many of these garage doors are still in fully working order today on many homes in the U.K.
Over the years, particularly in the late 1980's, many different steel designs started to appear from the likes of Cardale and Henderson doors as well as some smaller manufacturers. 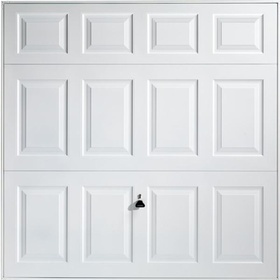 A lot of these garage doors were not particularly well designed and were trying to be copies of more expensive timber constructed garage doors. They did not really work and we started to see them withdrawn from brochures. 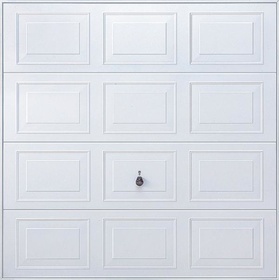 In truth if you want a steel up and over garage door you should stick to the original designs and their variations. 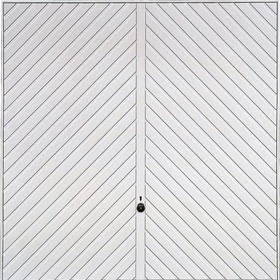 These are Horizontal, Vertical and Chevron (herringbone) ribbed designs with variation and the classic pressed 'Georgian' panelled door in many different panel arrangements as well as a doors incorporating 40's style windows and vertical lines - The 'Ilkley' or 'Salisbury' door. 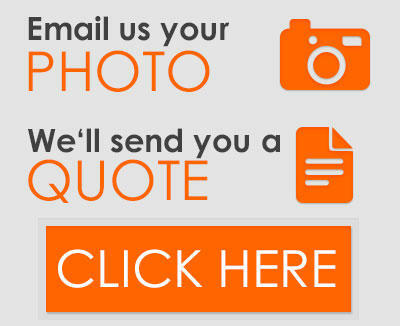 If you want other designs then you have to look at timber or GRP garage doors. 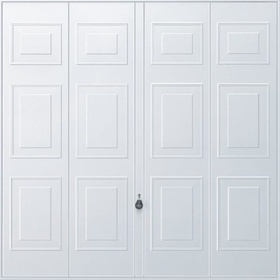 Back to the 21st century and we now seem to have gone full circle - with the demise of the Henderson and Cardale brand recently you only now have Hormann and Garador for a full range of steel up and over doors. 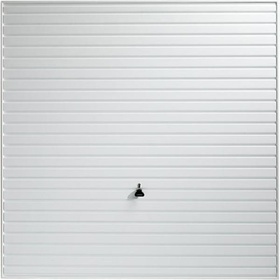 The Hormann range is the most comprehensive of door ranges if you include the N80 and DF98 range, produced in Germany with standard and made to order sizes in may different designs. 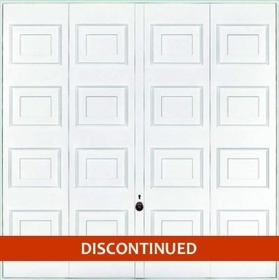 Garador manufacture their doors in Yeovil, Somerset and whilst their panels are not the same as Hormann, their operating mechanism is exactly the same as Hormann, as they own the Garador UK company outright. 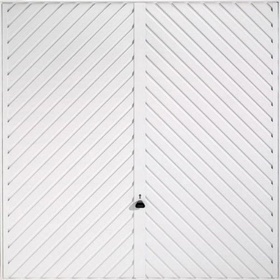 When you buy a Hormann steel up and over door you are buying the best steel garage door available in the U.K. and Europe, a door fine tuned to perfection since the 1950's. 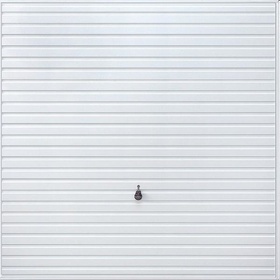 A Hormann steel up and over garage door offers many standard features to make it not worth even looking at other doors and in most cases the standard UK doors are some of the most competitively priced as well. 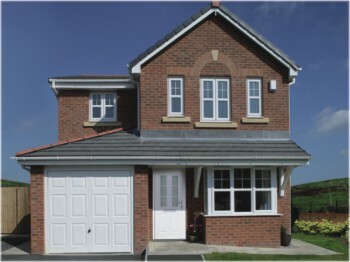 Very recently we have seen the introduction of 'Decograin' up and over garage doors. These are steel garage doors with a laminate foil applied to the surface in very effective woodgrain colours - Golden Oak and Rosewood. As well as these decograin finishes you can also now have powdercoat finishes front and back other than white. Green, Blue, Black, Red and Brown are the current colours on offer for a small extra charge. 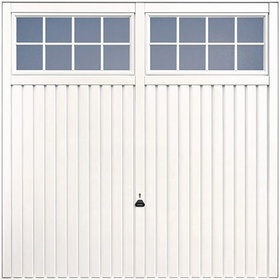 You can of course very easily paint the Hormann and Garador up an over doors whatever colour you wish as the powdercoat product used also acts as a primer only requiring a light sanding before traditional painting. 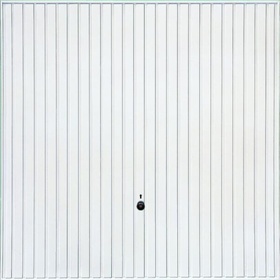 See the latest in designer steel garage doors with the brand new launch of the Garador Design 100 & 200 range. 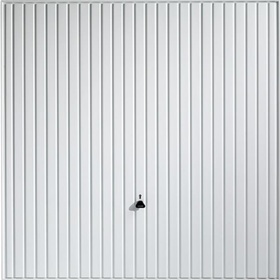 Minimalistic door panel designs with the addition of stainless steel elements to create a striking visual apperance with the added benefit of matching the Garador Frontguard or Hormann Thermopro steel entrance door ranges.